WaPo | Solo-ish | Analysis | Want to make your wedding more meaningful? We hosted a reception at a soup kitchen. I’ve never been happier to be kicked out of my seat — and it happened at my brother’s wedding. It’s an age-old story that weddings cause many happy couples to lose sight of what matters. A recent viral story featured a bride who asked her guests to contribute $1,500 each to her $45,000 destination wedding in Aruba, according to reports. Only eight friends came through, she said in her Facebook status. The groom’s parents at one point rescinded their pledge of $3,000, so she started a GoFundMe campaign that raised only $250. She became “livid” when her then-boyfriend suggested that, in light of these failed attempts, they instead get a quickie wedding in Sin City. They are no longer a couple. Even for more-levelheaded individuals, weddings can be expensive and stressful, especially when the community has certain expectations of what should take place. I’m an Orthodox Jew, and our weddings are no exception — especially since we throw seven wedding parties, the biggest affair the first night and then one a night for six more nights. Usually, family and friends host the last six — each one called a sheva brachot — by renting out a restaurant or even hosting a mini-banquet in their homes. But my family wanted to send off my oldest brother — the first of my siblings to get married — in a way that found a little more meaning amid the chaos. 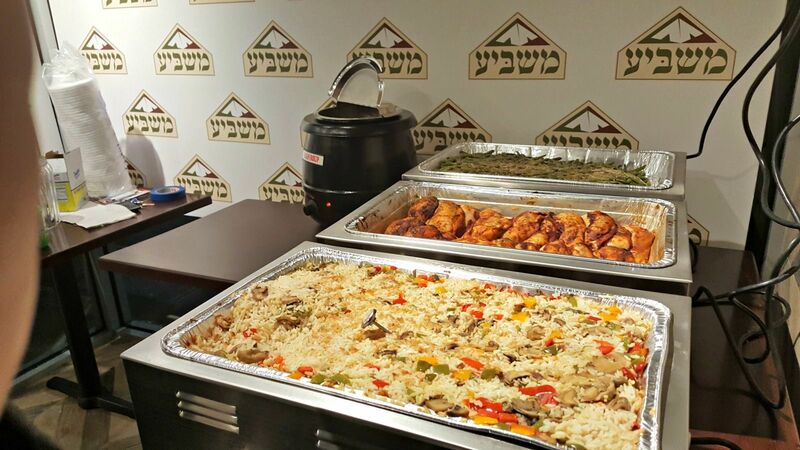 When my father suggested a few days before the big banquet that we host a sheva brachot at a Masbia kosher soup kitchen, it was such an obvious idea that I wish I had thought of it myself. Masbia has a few New York City locations, each designed as a restaurant, to help give its client base dignity. Rather than burn money at an expensive eatery, we could hold the party in a Masbia dining room, bring the regulars in on the fun, offer our guests something different and give a donation that would more than cover the costs. The week before my brother’s wedding, I shuttled him around in an effort to keep him happy. I was the “bestest Mensh,” to borrow Dwight Schrute’s term from “The Office,” referring to the Yiddish and German word for man. The groom was to be treated like a king. Sushi lunches were bought, last nights on the town were arranged, and three stops in one day at the suit store were completed. My credit card had friction burns, especially because I bought wedding attire I’d never wear again. But I didn’t mind spending for a happy occasion, and the prospect of a party at Masbia kept me going. It was something we actually wanted to spend money on, not simply the Most Expensive Party Ever. While planning the soup kitchen affair, I called Alex, the executive director, with a list of concerns. Would wearing suits, a show of wealth, make the regulars feel out of place? Could we take pictures? Would there be enough food for everyone? I didn’t want to get in the way of operations or cause the organization undue expense. And I wanted the regulars to feel a part of it. Read the full story in the Washington Post click here.